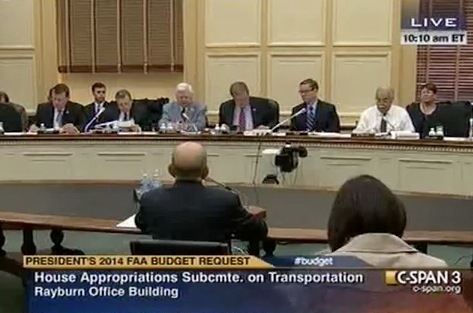 WASHINGTON, DC - Today, U.S. Rep. Harold "Hal" Rogers (KY-05) questioned Federal Aviation Administration (FAA) Administrator, Michael Huerta, during a House Transportation-HUD Appropriations Subcommittee budget hearing. The hearing also focused on the impact of the sequestration on the FAA and the Administration's failure to inform Congress and adequately detail industry shareholders on the decision to furlough federal air traffic control employees. The FAA began furloughing controllers on Sunday, April 21st, leading to aviation delays nationwide. In Rogers' opening statement, he expressed disdain over the failure of the Obama Administration and FAA to detail the projected operational impacts of sequestration. "You didn't inform the Congress of this sequester impact and what you planned to do about it. In fact, the entire Administration has done the same thing. They've not told the Congress how the sequester impact will impact each agency and the Congress can't operate like that. This imperial attitude on a part of the Administration, and you're the most recent example of that imperialism, is disgusting. And then, to turn around and try to blame the difficulties in flying on the Congress having not informed us of what you planned to do is unacceptable." During the hearing Rogers, questioned Administrator Huerta specifically about the decision to impose across-the-board furloughs. "I wish you had told us earlier, so we could have planned and perhaps try to find a way around the problem," said Rogers. "Now, when you decided to close those 149 contract towers, you said that your goal was to minimize the disruption to the maximum number of travelers. But when you decided to find savings in labor costs, just now, you imposed eleven days of furloughs across all FAA employees, regardless of how critical those employees are to the mission of safe, efficient air traffic control. It seems to me, we have contradictory reasoning when it came to decisions regarding contract towers versus the FAA and air traffic control workforce who are furloughed equally, regardless of how operationally essential they are." Rogers also demanded answers about the FAA's failure to adequately inform industry stakeholders, namely airports and airlines, about it's plans. “We told them that they should expect significant impacts at major hub facilities,” explained Huerta.